This was a tough call. Season seven of the Showtime spy drama "Homeland" was shot almost entirely in Richmond, Petersburg and South Hill. At north of $40 million, it represented the largest single filming expenditure in the state's history, according to the Virginia Film Office. Each Sunday night, local viewers tuned in to see how we looked. At Style, we blogged weekly stills of locations featured on the show, for those who may not have Showtime, or for those who didn't care for the show, but were still curious about how the city was portrayed as a stand-in for Washington. For our favorite moment, we chose a downtown location from episode six, where the show's two stars, Claire Danes and Mandy Patinkin, are walking past notable local monuments and buildings, talking spy smack. 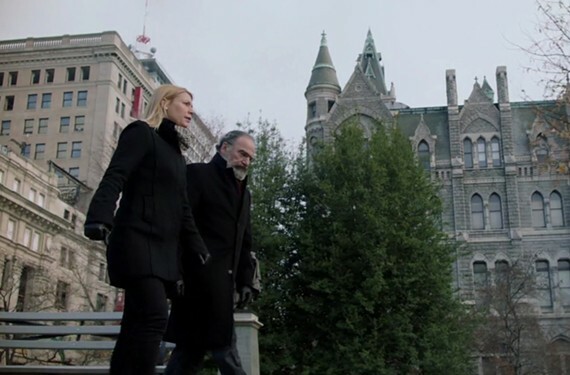 Old City Hall at 1001 E. Broad St. is featured twice in two striking shots: One shows Danes sitting on a bench with the Victorian gothic backdrop of Old City Hall looming behind, and another where a tracking shot is low to the ground, following Danes and Patinkin as they walk past the same building in conversation. It made us look like freaking London for a second there.